HomeBlogClient Case StudiesBest Client Ever – Children’s Bureau, Inc.
With over 165 years of experience, Children’s Bureau, Inc. advocates for children and their families in Central Indiana, particularly those who are at risk. Children’s Bureau partners with community organizations such as United Way and the Department of Child Services to provide community-based prevention programs, intervention and social services in 47 counties for more than 43,000 children annually. 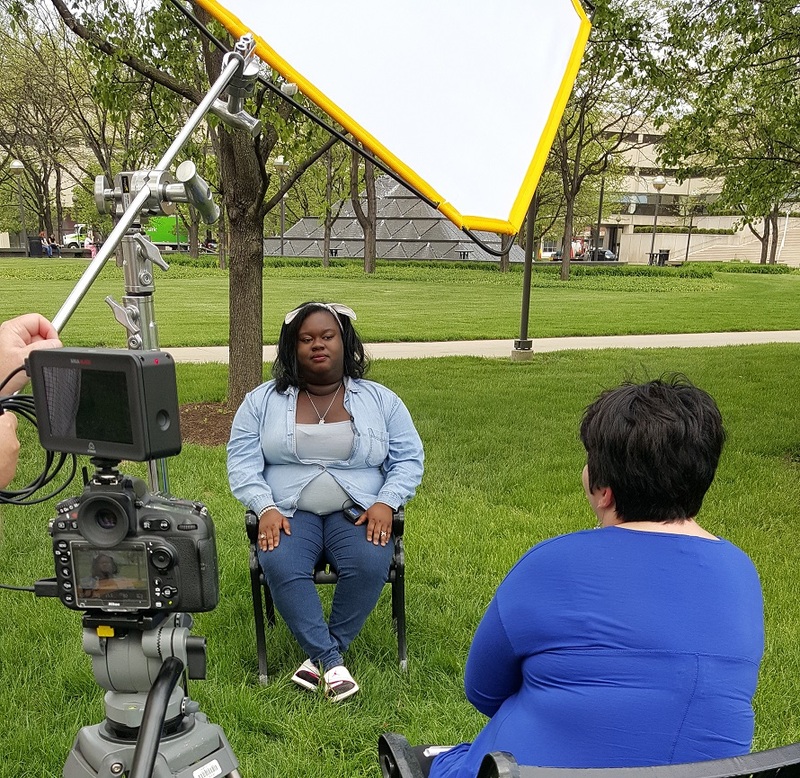 Leveraging private donations, grants and local corporate sponsorships, the non-profit’s goal is always to promote healthy, stable families for the youth of Indiana, supporting them in ways that help keep their kids out of the child welfare system. As an Indianapolis-based corporate sponsor, EverEffect partners with Children’s Bureau (CB) to help give kids and their families a better chance to succeed and to build a stronger community. Recently, we collaborated with Annie Martinez, Vice President of Communications & Development and Communications Coordinator Andrea Anibal on their 2016 Annual Meeting presentation, producing/directing an original video, Children’s Bureau: Partners on the Road of Life. Chris, Senior Search Marketing Manager Scott Hughes and Ron Tupper, Partner/Vice President Video Content talk about how EverEffect and Children’s Bureau have built a bond of trust and compassion to tell the unique story of this amazing community asset. Chris: Over the past year, EverEffect has been involved with Accelerent in Indianapolis, a platform for local companies to network, share visions and collaborate for mutual growth. Accelerent helps lay the groundwork for strengthening our city alongside our businesses and non-profits. Through Accelerent, Children’s Bureau reached out to us about creating a video for their annual meeting in June. From there, the partnership began to take on a life of its own. Scott: I was a volunteer in the early 90s. So much has changed for CB since then. Having worked with children through CB, helping them find their way during difficult times, I felt strongly about being at the initial strategy meeting. Chris: Scott’s understanding for their work helped the CB staff feel comfortable with us quickly. His passion also helped get them excited about the way we might tell their story in a nuanced way. This is so important, because CB has a real need for sensitivity around their work and clients. When you’re talking about intervening for parents who can become wary and afraid of losing a child to the foster care system, you want your primary goal of keeping kids out of the system to come across as meaningful. Children’s Bureau is incredibly successful at doing so. With open, productive meetings and Scott’s insight, we began to appreciate the delicate intricacies of telling CB’s stories. Chris: This project shows the impact of sharing a vision and working together to achieve it. Ron: It is an intensively collaborative process. We were working on the video while CB was working on their annual report. We wanted the video and the print piece to mirror each other in terms of look and feel and tone. So, we took still photos for the annual report while we were shooting video. Andi Anibal provided us with the graphic elements from the annual report, which we incorporated into the video as motion graphics. These cohesive visual elements help make the entire presentation eye-catching and add meaning to the statistics presented. CB did most of the scheduling for interviews that we recorded with case-workers and clients. We also had phone conferences with Andi and Annie Martinez to ensure we were on point, telling the true story of the Children’s Bureau. Chris: Once we had all the material, that’s when I realized this is more than a project, for me and for EverEffect. I understood better than ever why the messaging is so critical and has the potential to be so impactful. Ron: We needed to show CB’s benefit to children even though we did not interview children. It’s the core goal of Children’s Bureau to create meaning and stability for at-risk kids in Indiana. 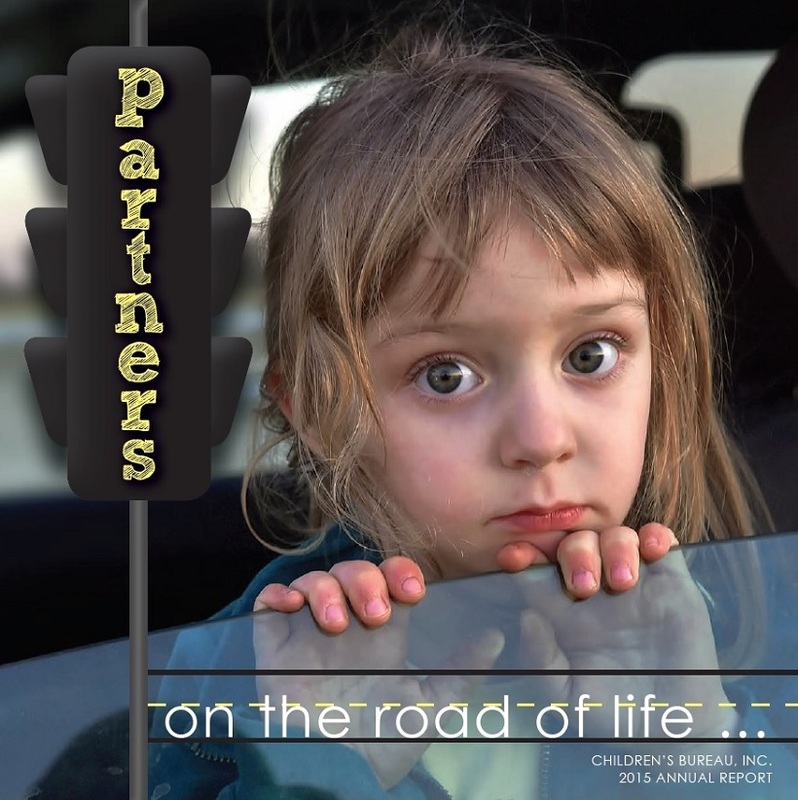 Their success rate at keeping kids out of the child welfare system is near 98 percent every quarter! It’s truly phenomenal. Both organizations wanted to make sure this powerful, positive impact is crystal clear. This kind of give-and-take collaboration is a very organic process that helps make the story of CB shine. The entire staff at Children’s Bureau was amazing throughout and trusted us with this incredibly important story, giving us creative freedom and control over capturing their vision. Scott: Annie’s eyes just lit up at the roundabout analogy because they’re trying to explain this concept of how people can come in and out of the Children’s Bureau at different times in their lives. They want people to understand CB is always there for them. There’s a multi-generational aspect to the support they provide. They loved the idea, and were excited about it because I think it helps illustrate people don’t just use CB one time. Services and support depends on individual circumstances. It’s a great community resource. The Children’s Bureau helps prevent kids from going into the formal child welfare system. It really works. 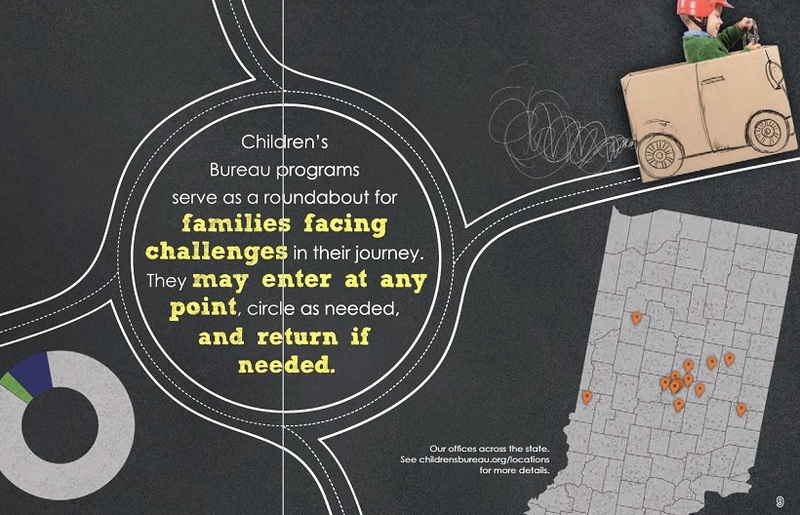 Ron: The roundabout analogy, that is the visual that ties the video and the annual report closely to the overall vision for the Children’s Bureau. Chris: For me, this project is so much more than producing a video or developing a business partnership. I am incredibly moved by the people we met. To hear about their struggles and see the power of their successes made possible due to the support of CB, it is amazing. Like the 19-year-old woman who is single-handedly taking care of her family despite so many challenges. Ron: I agree. The stories highlight how much parents love their children, even in tough times, and how they genuinely are ready to do the work of being a good parent. Sometimes people just need a little help. They also need to know that no matter how much they need help, they aren’t alone. The CB clients we interviewed are loving, compassionate and determined. Their stories help you to understand what people can achieve with the right support. Chris: We were on-site for just a few days shooting the annual meeting video, and the entire project took around four months to complete. During that short time, Children’s Bureau became more than a partner. It’s an organization I feel passionate about, and I know I’m not alone. 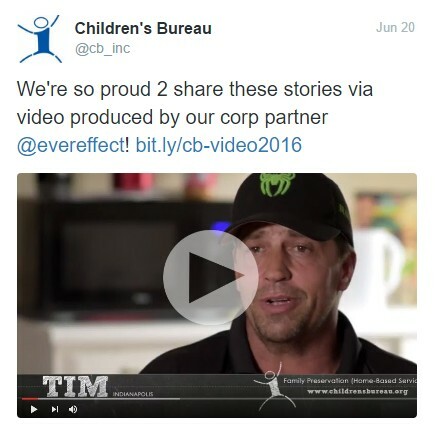 We think that’s why the video is so powerful -and the experience for attendees at the 2016 Annual Meeting so meaningful- because we knew the project mattered to real people whose personal triumphs rely on the success of Children’s Bureau. We care about those triumphs not just professionally, but personally. And that caring will last a long, long time. Currently we are working with CB on the redesign of their website, www.ChildrensBureau.org, and we’re looking forward to running that roundabout once again. Every once in a while, we EverEffect folks get together at a virtual roundtable to discuss business. Industry trends, creative strategies, favorite campaigns, tricky projects, compelling statistical evidence –anything is in the mix and everything is up for a talk-through. Then we share it all with you on the EverEffect Blog. If you’re curious about what we’re thinking, give our posts a read. Or give us a call at 888-506-2183 for a face-to-face. As a Premier Google Partner, EverEffect has exclusive access to Google expertise – a distinction given to only a select number of Google Partners worldwide. Now, we can help our clients and potential customers learn the latest industry trends and how to best leverage them through exclusive webinars with our Google experts. It’s just one of great benefits that come from the experience, dedication and results-driven success our clients receive.